I made a mad dash to the boatyard at lunch this afternoon to kick off a paint compatibility test. I'm really waffling between Interlux Perfection and Brightside for repainting the hull. Yes, I'm aware of the differences in durability, application, and price. But there's compelling pros and cons on both sides which I'll go into in more detail in the project pages. I'm thinking that I have a chance of making the decision easier by testing compatibility of Perfection with the existing hull paint. If Perfection's solvents are going to wreck the existing paint, then I'm going with Brightside. I'm not planning to sand off the existing stuff. Interlux technical support was fantastic. 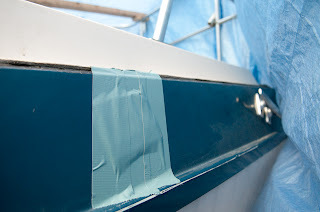 They recommended that I soak rags in Y2316N solvent, then tape the rag to the hull for 24 hours to reduce evaporation and maintain good contact. If the paint is damaged tomorrow, then I know it's not compatible. So, I decided on a number of different places to perform the test, made up a bunch of test rags, and placed them on the hull.